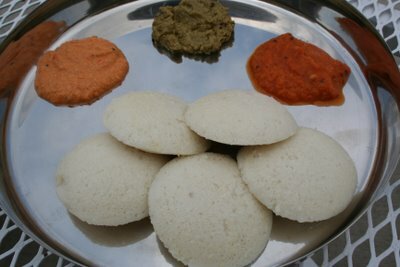 There are about 100 recipes on the net to make the perfect idli. I use my mom's. I brought back a counter top wet grinder from India last year and its the most useful thing I own right now. I love idli and dosa and was grinding the batter once a week with my american blender. It would take forever to finish grinding the batter, the motor would heat up fast and sometimes the idlis were not soft enough. All these problems were solved with my wet grinder. So last weekend i had idli with 3 different chutneys for brunch (To be honest, i just made one kind that morning and the remaining were leftovers). Soak rice and urad dal for 6hrs along with the methi seeds. Grind in a wet grinder. Add salt and let it ferment overnight. Aplly oil to idli plates to prevent idli's from sticking to the plates and steam idli's for about 15min. Serve hot with chutney or sambhar of choice. I served mine with red pepper-peanut chutney, pudina chutney and tomato onion chutney. (i) It is better to grind rice and urad dal seperately to get soft idli's. (ii) Add water in steps so that air gets incorporated when grinding urad al. (iii) This recipe is for grinding in a wet grinder. The proportions change for the blender. I have a suggestion for you for Squash soup! Send it to Meeta's FMR Pumpkin event before Sept.21st, it would be perfect, soup looks great!! Thanks asha. Your desserts looked gr8. Also thanks for the suggestion. I will modify my entry a bit and then send it for the FMR event.